My grandma Nellie Sullivan was a professional cook, a formidable presence in her home kitchen and an avowed gardner and canner of fresh vegetables but when it came time for her to be fed she always begged my parents to take her to “Silver’s” as she affectionately called Long John Silver’s Seafood Shoppe. Time to load up the Country Squire station wagon and head into town. Corbin, Kentucky is a rural hamlet tucked away in the foothills of the Cumberland Highlands region of Appalachia. In the 1970s the little town was abustle with activity: there was a Hardee’s in the old downtown area; a new McDonald’s on one of the main roadways, and a spanking new Long John Silver’s Seafood Shoppe that opened right next to the Burger Queen at the Trademart Shopping Center. Long John Silver’s Fish And Chips was born 90 miles north of Corbin in Lexington, Kentucky. The business was the brainchild of Warren Rosenthal, owner of Jerrico, a Kentucky restaurant group with roots dating all the way back to Shelbyville’s White Tavern Shoppe, a six seat hamburger joint opened by Jerome (Jerry’s Restaurants) Lederer in 1929. After gazing into his crystal ball (and studying Salt’s Fish and Chips, an existing business) Rosenthal coaxed Jim Patterson, a Jerry’s Restaurant franchisee aboard and the two launched Silver’s in 1969. As is often the case with rapacious businessmen, that lone location had morphed into 200 stores a scant two years later. To my child’s palate I thought Long John Silver’s was a fine restaurant. Crispy, salty, fried fish washed down with ice cold Coke is a perfect repast for a grammar school kid. I’m not sure why my grandma liked it so much but I suspect it was due to the disdain that most of the menfolk she fed on a daily basis had for fish. Neither my grandfather nor my uncle who lived with her liked or appreciated seafood so if she was going to get her fix it was going to have to be on the down-low when somebody would carry her into town. 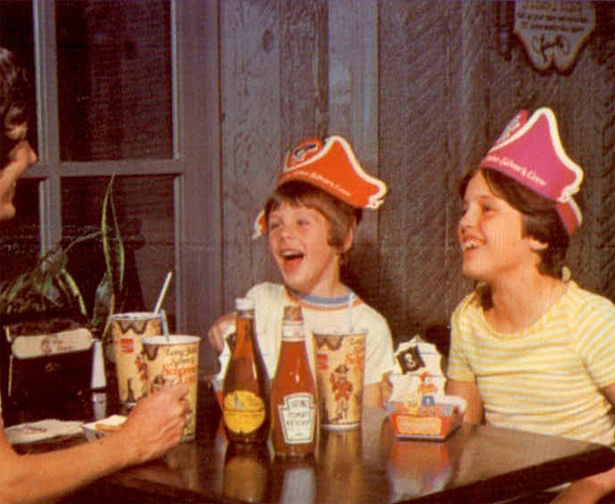 Long John Silver’s is still right where it was when I was a little kid. Nellie Sullivan has left this earth but she did manage to raise a cook who’s proud to walk in her footsteps. And I think about her every time I visit Corbin and ride past her favorite restaurant on earth. This entry was posted in FOOD and tagged jerome lederer, jerrico, long john silver's seafood shoppe, nellie sullivan, White Tavern Shoppe. Bookmark the permalink.